Running TestDisk 7.1, I'm getting a "Unusual media descriptor (0xf8=0xf0)" error on what was a perfectly functional hard drive. How do I diagnose and recover from this? 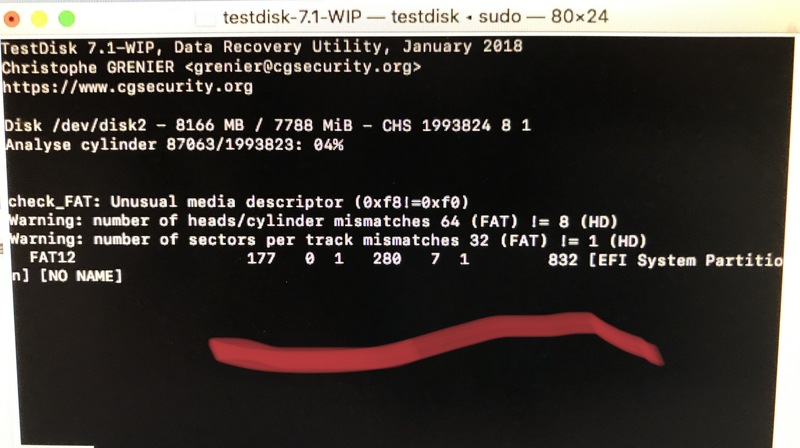 The best would be to simply stop running TestDisk and start using the drive for whatever purpose it was intended, and to the ask here for instructions, if that isn't working for you. I gather that you're dealing with a secondary, external drive and that it is probably a USB pen drive or similar of 8 GB size. The pen drive has been formatted as a hard drive, while the TestDisk software marks this is as "odd" as it believes it should have been formatted as a floppy drive instead. In reality there's no real difference between the two for most, if not all, purposes that concern macOS. If you really want to get rid of this TestDisk error, all you have to do is simply repartition and reformat the drive. Not the answer you're looking for? Browse other questions tagged hard-drive high-sierra partition ssd error .